Maxi dresses are sure to make you feel very pretty! Navy blue looks amazing with lavender, blue, chartreuse, yellow, orange, green, red, white, gray, and brown. Maxi dresses cover you up but they make you feel glamorous and gorgeous! Maxi dresses are just so pretty and feminine. Wear a navy blue maxi dress by itself in spring/summer and under layers in fall/winter. Maxi dresses are inherently better for play than work - they are excellent for the weekend, lunch, or dinner. Wear plain, simple maxi dress styles for casual occasions and decorative, fancy versions for parties. 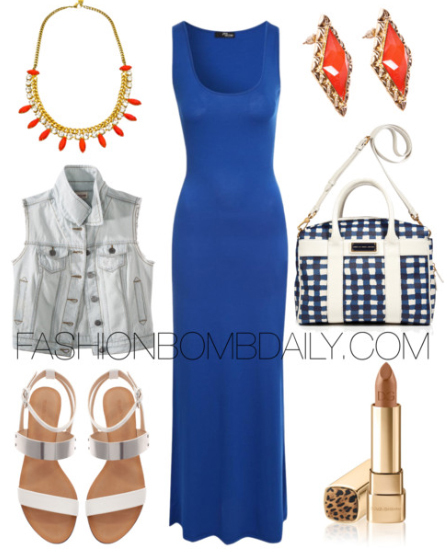 Knowing how to wear navy blue maxi dresses is easy with this guide!